Ever wonder what the CEO of one of the world’s leading music retailers thinks of Digital Rights Management? Today Steve Jobs of Apple Inc. told us in a message titled “Thoughts on Music” which I hope we will some day look back on as the beginning of the end for DRM. Why would the big four music companies agree to let Apple and others distribute their music without using DRM systems to protect it? The simplest answer is because DRMs havenâ€™t worked, and may never work, to halt music piracy. If you are interested in DRM or would like to learn more about it and why it’s such a hot topic right now, I highly recommend reading Jobs’ entire post. Remember, Apple is currently ahead in this field and if anything has the most to loose if they lost their brand lock-in. 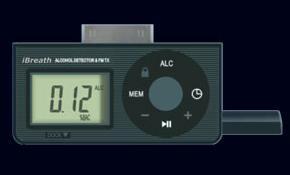 Well I certainly wasn’t beating down the door for the Nike + iPod Sport Kit but now DavidSteel.com has come up with an iPod accessory I could really use: an Alcohol Breathalyzer with Integrated FM Wireless Transmitter! Dubbed the iBreath, the device powers itself off the iPod battery, supports the full FM band (88.1 – 107.9) and claims accuracy within 0.01% blood alcohol content. I want one, don’t you? Thanks to Will for sending this on to me. This Week in Tech Podcast – Feed your Inner Geek! There are a lot of dry monotone technology podcasts out there, but Leo Laporte’s TWiT podcast isn’t one of them. Every week Laporte brings together a cast of industry leaders to discuss exciting technology topics ranging from the latest offerings from Microsoft to what’s new on RFID hacking. Laporte, along with regulars Patrick Norton and John C. Dvorak are joined by other technology professionals for this roundtable discussion. Together they run through a dozen or so top technology each week. Typically these podcasts are a bit over an hour, but if you have a long drive like I do, it’s an hour well spent. If you work in or are studying technology, especially information technology, you should check out the TWIT podcast. Get the MP3 or AAC version on iTunes! Posted on September 8, 2006 September 11, 2006 Categories Information Technology, TechnologyTags mp3, podcast, tech, Technology1 Comment on This Week in Tech Podcast – Feed your Inner Geek! For the record, choosing an iPod was easy, choosing a case was very, very difficult. Finally fed up with waiting for the battery replacement on my 10GB 3rd generation iPod I went out and bought myself a black 60GB iPod last week. Too many choices. When all was said and done I settled on the Agent 18 VideoShield. I had seen an Agent 18 on a coworker’s nano and it seemed to fit the bill. I got the case earlier this week and it’s fantastic. The case is hard plastic and protects the back, body and screen very well. At $25 the price is right in line with other cases. The bigger problem could be finding it. I got mine at The Apple Store. Overall the Agent 18 VideoShield comes highly recommended.